Wirebound notebook front cover is printed with a graphic design. Water-resistant plastic front and back covers protect notes. 1 subject notebook has 100 college ruled sheets. 11" x 8 1/2" perforated pages. Notebook is 3-hole punched. Includes 2-pocket page divider. View More In Columnar Books & Pads. 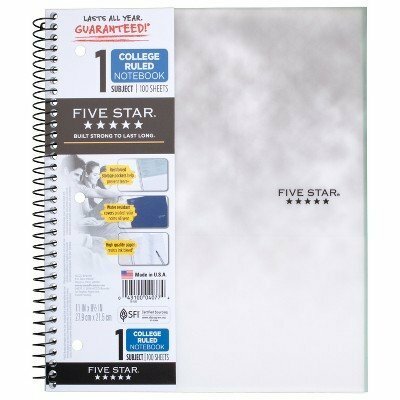 If you have any questions about this product by Five Star, contact us by completing and submitting the form below. If you are looking for a specif part number, please include it with your message. © 2019 - findwritingservice.info. All Rights Reserved.